Migration of Semitic peoples took place already in the Early Dynastic Period. The Semitic peoples merged with native population and adopted Sumerian culture, religion and form of government. Lugal-zage-si failed to establish strong and centralized Sumerian state under his authority what was taken advantage by Sargon of Akkad who came to power by overthrowing the king of Kish in 2334 BC. 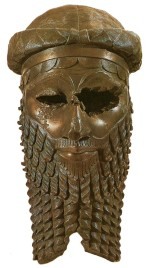 Sargon established his capital in the city of Akkad (which has not been located yet), defeated Lugal-zage-si, conquered all Sumerian city-states and established imperial authority over Sumer. During his 56-years long reign Sargon extended the frontiers of Akkadian Empire to Syria and Elam (today’s Iran) reaching the Mediterranean Sea on the west and Persian Sea on the south-east. Sargon’s two sons who succeeded him in turn, Rimush and Manishtishu managed to retain the territory conquered by their father. The power of Akkadian Empire began to decline under Sargon’s grandson Naram-Sin and after his death in c. 2218 BC the Akkadian Empire was invaded and overran by the Gutians, a tribe from Iranian mountains Zagros. Besides establishment of the imperial authority over whole Mesopotamia for the first time in history, the Akkadian Period is also notable for the introduction of despotism. Akkadian kings replaced the former supreme authority of priest-kings and were raised to the divine status. Changes also occurred in culture, art and religion, while Akkadian language replaced Sumerian as official language. Many changes from the Akkadian Period were abolished in the Neo-Sumerian Period which started about 2150 BC when ruler of city of Lagash, Gudea (famous for great number of his statues that were found during archaeological excavations) extended his authority over larger areas of Mesopotamia. Sumerian language was restored as official language and the former system of city-states was renewed although the kings of the 3rd Ur Dynasty (c. 2100 BC - 2000 BC) under which the Sumerian civilization flourished for the last time adopted despotic form government from the Akkadians. 3rd dynasty of Ur was founded by Ur-Nammu shortly after Utu-hengal, governor of Uruk decisively defeated the last king of Gutinians about 2110 BC. Under Ur-Nammu and his successor Shulgi the 3rd Dynasty of Ur established its authority almost over whole former Akkadian Empire. The Neo-Sumerian Period is also notable for its monumental architecture the finest example of which is the Great Ziggurat of Ur built by Ur-Nammu who is probably better known for Code of Ur-Nammu, the oldest known law code. 3rd Dynasty of Ur and the Sumerian Renaissance finally ended under Ibbi-Sin (c. 2028-2004). Sumerian territory was repeatedly attacked by Amorites, Semitic people from the west - most likely from Syria and Canaan, while the situation was made worse by the outbreak of famine at the end of 2nd millennium. The Elamites who renewed their independence sacked and destroyed the city of Ur and captured Ibbi-Sin in 2004 BC what was the end of the 3rd Dynasty of Ur. The Sumerian state after the fall of 3rd Dynasty of Ur was fragmented into several city-states among which Isin was the strongest. At the same time Amorites started to settle in the area of southern Mesopotamia and eventually overtook important political positions. Gungunum (1932-1906 BC) of Larsa founded the first Amorite dynasty, seized the old capital Ur and became a rival to Isin. Sumerians as a nation slowly disappeared but Sumerian culture continued to spread beyond the borders of former Sumerian civilization.